Rumors bolstered by spyshots have been floating around the internet of a replacement for the 612 Scaglietti and today, Ferrari officially announced the new FF concept. The FF stands for Ferrari Four, as this 4-seat “shooting brake” hatchback features Ferrari’s first ever four wheel drive system mated to a 6.3L V12 churning out 651 horsepower and 504lb-ft of torque. Power is sent to the wheels via a dual-clutch F1 style gearbox and with the help of the advanced AWD system, the new FF can rocket from 0-100kmh (62mph) in just 3.7 seconds while hitting a top speed of 208 miles per hour. “Wow” is right. The Ferrari FF features the company’s new 4RM all wheel drive system, which the automaker claims 50% less than a traditional AWD system, helping the FF achieve a front-rear weight distribution of 47% front and 53% rear – helping to ensure that the new Ferrari handles as well as it accelerates. Ferrari points out that not only is the AWD system great for both track use and getting safely through the snow. 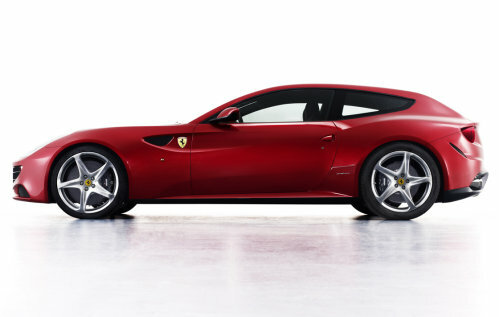 Other automakers have been quick to follow the trend of the 4-door supercar to offer more seating than the traditional 2-seater supercar but thanks to the Pininfarina shooting brake design, the new Ferrari FF allows enough room for four with some added cargo space – without converting to the sedan form. This new FF is ideal for the (very wealthy) family man who wants a vehicle that will be competitive at track days while also being able to get the wife and kids to grandma’s house with a trunk full of presents. With the passenger and cargo space of a sedan and the aggressive styling of the modern Ferrari lineup, the new FF is the ideal super-versatile supercar for anyone who wants more room for joyrides in their Italian exotic. Check out the gallery below for a closer look at the new “Ferrari Four” and stay tuned for the public debut of the new shooting brake supercar at the Geneva Motor Show.